"Candy World! Dada, let's go play Candy World!" Every night, right before bedtime, that's about all I hear from my four year old. She means CandyLand, of course. But Candy World sounds much more fun, doesn't it? I think so. I think I'd like to live in an actual Candy World, like some Wonkified version of reality where everything, on a whim, could be candy. Sounds great. Love candy. Love chocolate. Love Trader Joe's, too. So if TJ's comes out with a chocolate bar, no matter how large, goofy, imitative of a classic, or potentially combustible, I gotta try it. All that does not mean I have to love the new Trader Joe's Golden Spiced Milk Chocolate Bar. 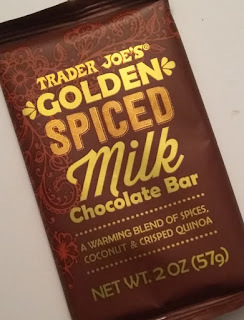 This is not my first go-around with a TJ's spiced chocolate product. Admittedly, this new particular bar is a fair amount more successful than those caramels. But it shares some of the same pitfalls. 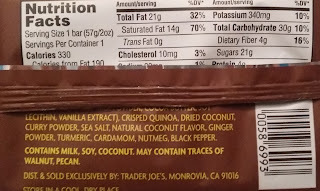 Namely, ginger and chocolate are two flavors that need to be carefully combined for optimization. With this bar, toss in a healthy dose of cardamom, too. And I mean healthy. It's the first thing I smelled when I opened the wrapper, like Hershey-fied potpurri. And honestly, it's kinda how it tasted, too. The ginger and cardamom weren't overpowering per se, as I could still taste the milk chocolate enough to determine it was of fairly good quality. But the other spices - curry? Pepper? Heck, even the coconut? Nope, nada, none, except for a small bite I had that seemed particularly salty. None of that "warming" that the label speaks of on the front. The crisped quinoa did add a nice little gritty bite, a la crisped rice but a bit smaller, but in the end, I wasn't that happy with the bar. Honestly, this chocolate bar may have been trying to do a little bit too much, but ended up not really excelling at anything in particular. It's okay, not great...perhaps I lack the proper sophistication to truly appreciate it and should stick to my Butterfingers like the plebe I am. Sandy enjoyed more than I did, noting her affinity for anything with cardamom. Still, even she could offer it only a lackluster three. Eh well, just as I remind my four year old when we play Candy World, you can't win them all. We loved it! 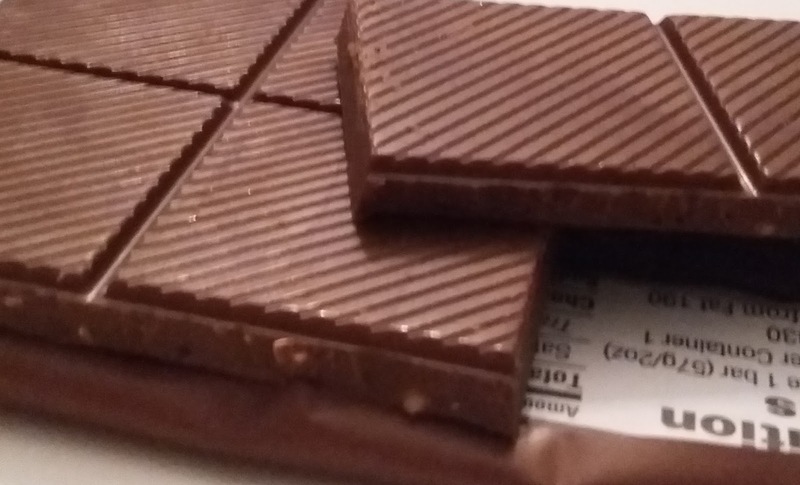 The chocolate is smooth and creamy. The delicate blend of spices was well balanced. You could taste all the spices and not one was overpowering the other. 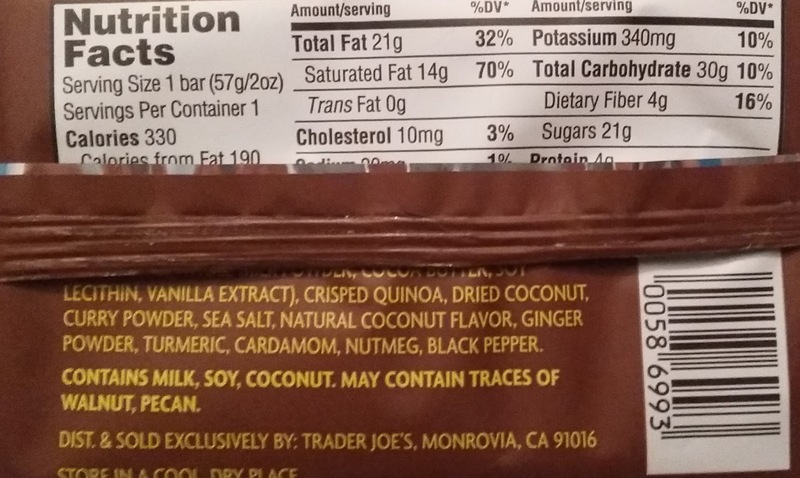 The quinoa crisp added a light crunchy texture. I'm addicted. This is my new favorite chocolate bar. Good job! Please don't stop making these! Normally I am not a fan of milk chocolate, but I was pleasantly surprised. The spicy combination worked perfectly with the milk chocolate. My only regret was that I should have purchased two bars. Oh my god I thought it was INCREDIBLE! I just had one now for the first time, maybe they tweaked it in the time since you had it? I easily tasted ALL of the listed flavors, honestly it was mindblowing to both me and my husband how balanced it was. Eerily, even. Please keep these around, TJ'S!